- those who want a high nourishing and moisturizing action. 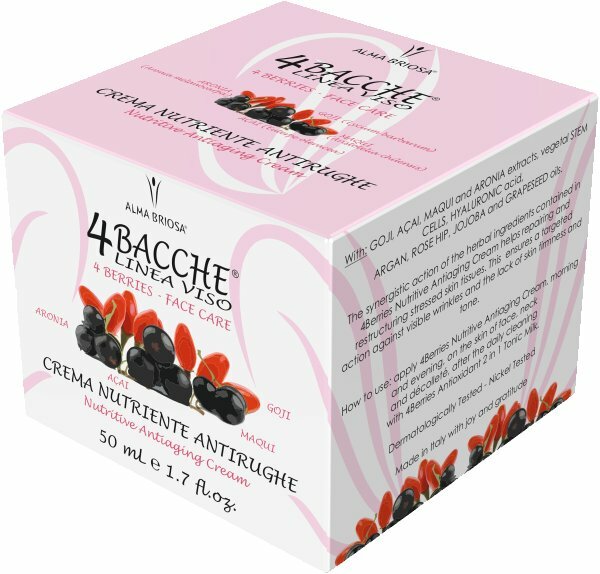 The synergistic action of the herbal ingredients contained in 4Berries Nutritive Anti-Ageing Cream helps repair and restructure stressed skin tissues. This formulation ensures a targeted action against visible wrinkles, providing action against the lack of skin firmness and tone. 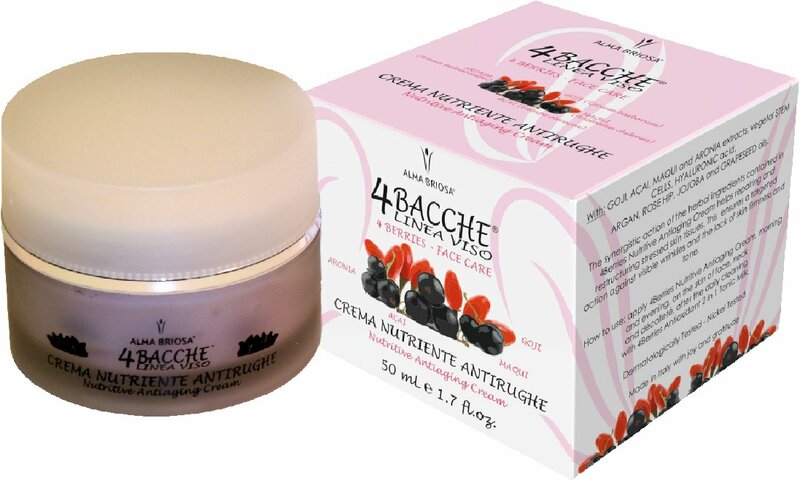 How to use: gently apply 4Berries Nutritive Anti-Ageing Cream on face, neck and décolleté after daily cleansing with 4Berries Antioxidant 2 in 1 Tonic Milk. INCI	 INGREDIENTI/INGREDIENTS: Aqua**, Decyl oleate**, Vitis vinifera seed oil**, Simmondsia chinensis oil**, Cetearyl alcohol**, Sodium cetearyl sulfate, Glycerin**, Argania spinosa oil */**, Aristotelia chilensis fruit juice */**, Aronia melanocarpa fruit extract**, Euterpe oleracea fruit extract**, Lycium barbarum fruit extract**, Rosa moschata seed oil**, Sodium hyaluronate**, Vitis vinifera fruit meristem cell culture**, Benzyl alcohol, Potassium sorbate, Limonene**, Citrus limon peel oil**, Citral**.